1 bedroom, ground floor apartment five minutes walk from nearest beach. REDUCED FROM 68 TO 55 EUROS PER NIGHT FOR THE BEGINNING OF SEPTEMBER. THE PRICE ADVERTISED IS THE PRICE YOU PAY AND INCLUDES REFUNDABLE DEPOSIT, CLEANING AND CHARGE FOR KEY PICK UP AND DROP OFF AS WE THINK THIS GIVES A MORE SEAMLESS EXPERIENCE FOR THE GUEST. The apartment has an open aspect overlooking the tropical gardens of the complex.The complex itself, although near to the beach, shops, restaurants and bars has a quiet and calm ambience. It is in an area called Rocio Del mar which is approximately six kilometres from the popular and vibrant town of Torrevieja which lies about 50 kilometres south of Alicante. Torrevieja has an abundance of shops and restaurants and also has a daily market, a pier, a water park and two large salt lakes. The climate is hot and sunny in the summer and very mild in the winter which attracts all year round visitors. From Rocio Del Mar there is a regular bus service into Torrevieja. It is possible to then catch a bus from the main bus station in Torrevieja either up or down the coast. If you wish to remain local and are relatively fit there is a walk along the seafront into Torrevieja which takes just over an hour at a leisurely pace. You can also walk, drive or catch a bus in the opposite direction along the coast to Playa Flamenca -approx 1km away, La Zenia beach - approx 1.5 Kms away. Cala Capitan, Cabo Roig and Mil Palmeras are easily accessible. There is a path along the seafront from Playa Flamenca to Cabo Roig that is popular with walkers and cyclists. The nearest Golf course is at Villa Martin approx 4 kms away. There are other Golf courses in the vicinity. 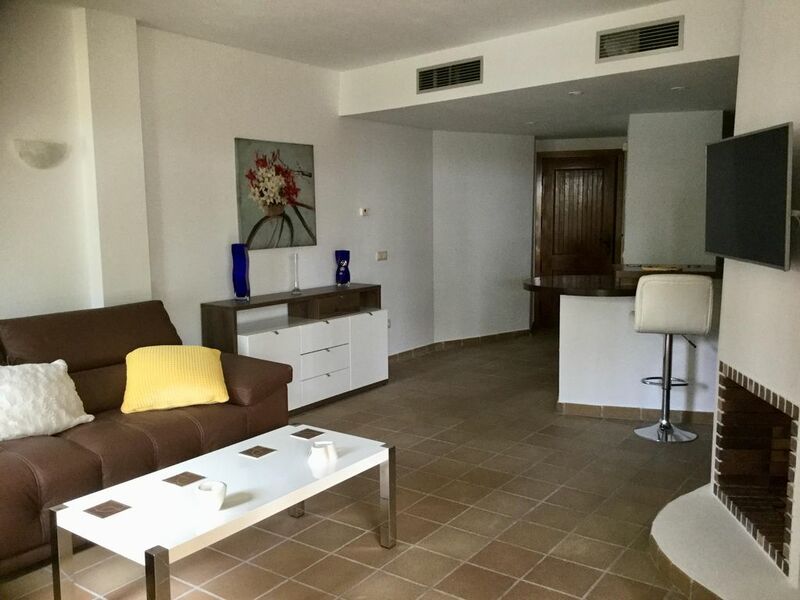 The apartment is set in the gated community of Panorama Park which is well known as the ‘Jewel in the Crown’ of the Costa Blanca and the owners work hard to ensure that the complex is well cared for. The exterior of the apartment block has been recently painted and the paths treated and refurbished. The gardens are delightful and tended daily. The complex has 24 hour security and is well lit at night and is perfect for family holidays. one bedroom with built in wardrobes and double bed with patio doors leading to west facing terrace. One bathroom which is En-Suite and consists of enclosed toilet and bidet, His and Her sinks, full size separate bath and new walk in shower. The American style kitchen has a breakfast bar and all appliances as follows: dishwasher, full sized cooker, fridge-freezer, washing machine, microwave. The kitchen contains everything you require to prepare food in the apartment. The large lounge has patio doors leading to the west facing terrace. Their is a Smart TV with English TV and Netflix and a free Wi-fi internet connection. The lounge has a good quality leather Chaise longue which also folds out with one pull into a full sized double bed. The terrace has a dining table and four chairs for outdoor dining and a seating area. There are 2 swimming pools, one with integrated child’s pool. The nearest pool is about 30 metres away but because it is situated at the back of the apartment it is not intrusive. The apartment is approximately 450 metres to the nearest beach/Sea with no dangerous roads to cross. There are restaurants, bars and shops, the nearest being about 200 metres away. The popular shopping areas of La Zenia Boulevard and Habaneras are within easy reach. and cots at a minimal cost. We have owned the apartment since 2005 and have recently refurbished it to a high standard. The complex is gated with full non intrusive CCTV and 24 hour security. The tropical gardens are tended daily and the complex is well lit at night. The complex has a relaxed, quiet feel. The bathroom is en-suite and has an enclosed toilet and bidet, His and Her sinks, a full sized bath and walk in shower. The air conditioning/heating is controlled by a meter which takes 1 and 2 Euro coins. The meter is very reasonable to run. The heating/air conditioning is controlled by meter which takes 1 and 2 Euro coins. The meter is very reasonable to run. Clean towels provided for use inside apartment. Full sized fridge freezer in the kitchen. Their is a small coffee percolator. Plenty of dishes and utensils for four people. Equipped for 2 to dine at breakfast bar. Table and chairs for 4 people on the terrace. Smart TV with English channels with Netflix and free Wi-fi. Set in well cared for quiet communal gardens. Good sized quiet west facing terrace/balcony overlooking gardens. Bikes can be hired locally. There is a tennis club in nearby Los Balcones. There are many golf courses in the area. The nearest is at Villa Martin about 4 km away. Mini Golf La Mosca is about a 2km walk away. It is laid out on a rooftop with fantastic sea views. There is a small step to the front door of the apartment block. The approach to the apartment and into and around the apartment is completely flat. There us a small step over the French door frames to access the terrace. There are two communal pools in the gardens, one has an integrated area for small children. Thank you for taking the time to write a great review. We're really glad you enjoyed your stay and would gladly welcome you back. Truely a home from home, everything you need for a great hoilday experience has been provided. A lovely clean and well maintained apartment in a fantastic location. The beach is approx 5 mins walk away and the same for the shops bars and restaurants. Peter and Elizabeth went out of they way to make me feel welcome. As a single female holidaying alone the complex felt extremely safe and secure. The pool area and gardens are very well kept and not at all over crowded. I even had the pool to myself on some days. Love the addition of english tv channels on the evenings when I just wanted to have a drink on the large balcony. I wouldn't hesitate to recommend this property and look forward to returning. Thank you Debbie for your lovely review. We're really pleased that you felt safe and secure in our apartment and enjoyed the pool and complex. You will be very welcome back in the future. My mum and sister rented this apartment and thought that this was very nice . L'appartamento è fedele alle fotografie inserite nel sito di Homeaway. Molto molto grazioso, pulito e funzionale. Pieno di comodità. È inserito in un residence altrettanto bello e molto pulito, con una cura giornaliera dei giardinieri che ne fanno un "paradiso terrestre" ricco di piante meravigliose. La notte c'è una sorveglianza che passeggia lungo i vialetti il che non guasta per una maggiore sicurezza! Ringraziamo Peter ed Elizabeth che, seppure da lontano perché non sono sul posto, sono stati molto gentili e premurosi e un grazie anche alla signora Lyuba che ci ha consegnato le chiavi. Il mare è raggiungibile a piedi passando internamente al residence che ha diverse uscite per poi percorrere una strada e arrivare a Punta Prima dove c'è un ristorante e un bar che gestisce 10 ombrelloni e lettini....il resto è spiaggia libera. Lo consiglio vivamente. the coast but are about 1.5 - 2 Kms away. They can be reached in a car in 5 minutes. Along the main coast road and within walking distance there are several bars, restaurants, supermarkets and shops. There is also La Mosca mini golf which Is situated on a rooftop with lovely views across the coast and Go-Karts Orihuela Costa. The cleaning fee above is included in the price you pay at the time of booking, you do not pay any extra when you arrive or leave. If your stay is for more than 1 week we can arrange for mid holiday clean and change of linen for a further 40 euros if you require. A welcome pack can be provided which would be extra and can consist of basic items at your request. The receipt is provided for you to pay to the housekeeper. In order to use the air conditioning there is a meter which accepts 1 and 2 Euro coins, 1 Euro lasts about 4-5 hours. In order to maximise your value for money you need to have all doors and windows closed and set the temperature at a reasonable level.